Is it important to your organization that your suppliers are professionals in their specific industry? Standards like ISO9001 and AS9120 do not address the details that assure you that your independent electronic component distributors are performing the industry’s best practices. The IDEA-QMS-9090 standard specifically addresses each essential procedure for independent distribution. Many procurement professionals rely on their salesperson’s unaudited assurance, at the broker who they “like best,” or they just leave it up to their unprepared contract manufacturer to take care of their difficult parts. In this new market flooded with fakes, more is needed to protect your organization. Poor quality electronic components from the broker market have a very specific set of problems. AERI offers IDEA-QMS-9090 electronic parts to ensure the greatest quality and durability. AERI’s compliance to this standard allows you to feel safe that you will have no surprises. By using the IDEA-QMS-9090 standard for obsolete parts, poor quality and counterfeit components cannot get though the shield of procedures. 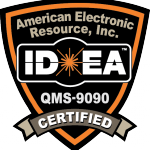 Please contact your search expert or our quality director for more information about IDEA-QMS-9090 or any of our other quality procedures used to inspect electronic components.